Arrival at Ben Gurion airport at 0400 Meet your guide and transfer to your hotel in Tel Aviv and rest of the evening is at leisure. Overnight. Breakfast. In late morning we shall proceed for the city tour of Tel-Aviv; Israel's cultural and commercial capital. Visit the open air Carmel market. See the colourful stalls with fresh produce, condiments, herbs, spices, baked goods & various paraphernalia. Drive via Rothschild Blvd where the Bauhaus architecture predominates the landscape. Continue to Jaffa for the Old Port, Artist Colony and the Flee market. Overnight Tel Aviv. Breakfast. Depart Tel Aviv and drive along the coastal road to Caesarea, built by King Herod and once the capital of Judea. Visit the amphitheater and see the huge aqua-duct and hippodrome; see the excavations of the Crusader city. 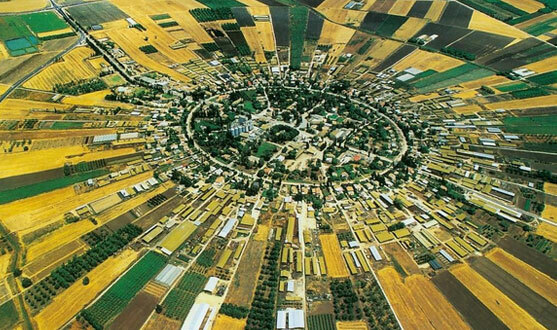 Drive via Haifa, Israel's largest port city and view the world famous Bahai Gardens. On to Akko the ancient crusader port and visit the Knights Templar subterranean halls. Drive thru the Galilee for overnight in a Kibbutz Guest house. Lecture by a kibbutz member on life at this unique community living according to the Communism manifest. Overnight. Breakfast. Drive to the Sea of Galilee for a tranquil boat ride. Continue to Capernaum, home of Peter and center of Jesus preaching and visit the 2nd century synagogue. On to Tabgha, site of the miracle of Multiplication of Bread & Fishes and visit the church of Multiplication with its unique mosaic floor. Enjoy OPTIONAL - $ 20 a picnic lunch on the shores of the Sea of Galilee (IT IS A SIMPLE LUNCH WITH PACK LUNCH SITTING ON SEA OF GALILEE). Continue to NAZARETH for a visit of the town. Overnight. Breakfast. Early morning leave the Galilee and travel via the Jordan Valley and Jericho to JERUSALEM. Jerusalem Old City - Ascend to Mt Olives for a panoramic view of Jerusalem & Bethlehem. See the church of Dominus Flevit (the Lord Wept), built in a shape of a tear drop and walk thru the Garden of Gethsemane. Cross the Kidron Valley and enter the Old City. See the Temple Mt and visit the Western Wall. Enter the restored Jewish Qtr and walk along the Cardo, the ancient main street of Jerusalem during the time of Jesus. Pass thru St. Stephens Gate and reach the Crusader church of St Anne. Visit the Pool of Bethesda, and follow the Via Dolorosa to the Church of the Holy Sepulcher. Evening – Sound & Light show at the David Citadel (closed Tue + Fri) depends on the date. Overnight. Breakfast. On this day, we can have an OPTIONAL LUNCH at MAHNE YEHUDA MARKET- TASTE MENU IN THE DIFFERENT STALLS IN THE MARKET TOGETHER WITH A CHEF. 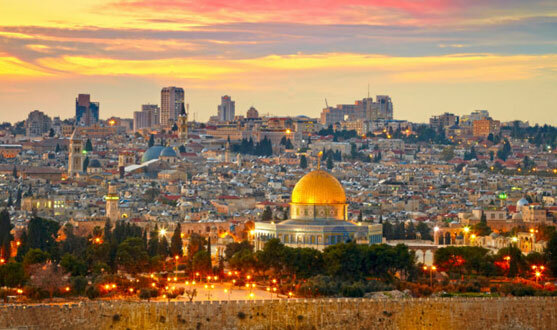 Jerusalem New City – Drive to the Jewish orthodox quarter of Mea Shearim and learn of the extremely religious' way of life, and culture. Continue via the Knesset and see the symbol of the Menorah, on past the Supreme Court, and reach the Israel museum that houses the Dead Sea scrolls, which were discovered by a shepherd in the Qumran caves. Arrive to Yad Vashem, Israel's memorial to the Holocaust victims. Walk along the Avenue of the Righteous, visit the museum & the Children's Pavilion (closed on Sat). Drive south of Jerusalem to the village of Neve Shalom (Oasis of Peace), where Jews, Moslems and Christians live together. Tour of the Village and learn of this unique community where the 3 major religions live and educate their children. Dinner and overnight Neve Shalom. Breakfast. Descend to the lowest spot on earth – 400 meters to the Dead-Sea. Visit Ein Gedi, the desert oasis, and walk in this unique national park learning of the flora & fauna that grow in this harsh region. Drive to Massada, built as a winter castle by King Herod and the last strong hold of the Jewish zealots against the Romans and who committed suicide in 73AD rather than becoming enslaved to the Romans. Ascend by cable-car and visit the storage area, bath-houses & ancient synagogue. Descend the mountain and enjoy a swim in the mineral rich therapeutic water of the Dead. 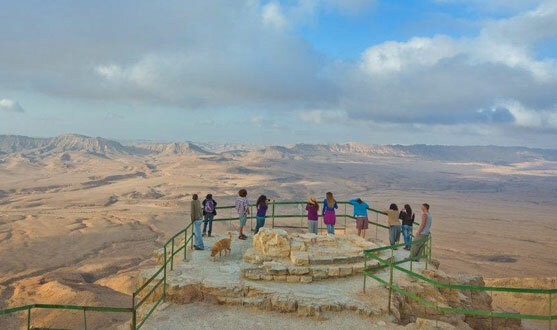 Drive south to Mitzpe Ramon for dinner & overnight in the Negev Desert by the Ramon Crater. Breakfast. Early morning OPTIONAL Jeep ride (2 hrs) in the Ramon Crater THROUGH THE SPICE ROUTE. The crater thought to have been created when a meteorite struck the earth. And see the unique geological formations of the Makhtesh. Visit the Bedouin village of Aricha and learn of the desert nomad's life & customs. Depart north from the Negev to Ben Gurion airport for your departure flight.